Ben Affleck's appearance on Bill Maher's "Real Time" on Friday turned into a somewhat heated discussion when Maher and author Sam Harris voiced their opinions on Islam. 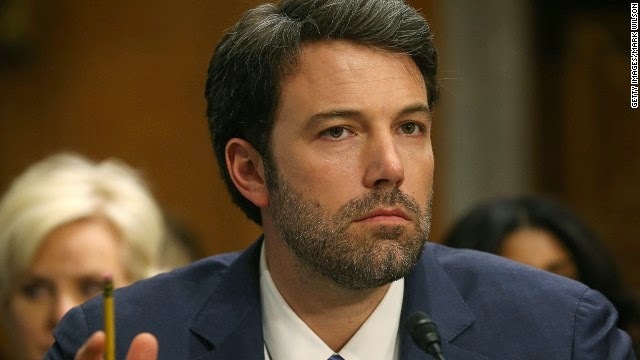 "Gone Girl" star Affleck took umbrage at the pair's contention that Islam is, in Harris' words, a "mother lode of bad ideas" and that liberals are squeamish about criticizing Islam for stances on women and LGBT issues because people "have been sold this meme of Islamophobia, where every criticism gets confused with bigotry toward Muslims as people." Affleck said Harris -- a neuroscientist known for works criticizing religion -- and Maher were guilty of using a broad brush themselves. "It's gross. It's racist," Affleck said. "It's like saying 'shifty Jew.' "
Affleck added, "How about more than a billion people who are not fanatical, who don't punish women, who just want to go to school, have some sandwiches. ... It's stereotyping." Maher disagreed, questioning Affleck on his stance: "You're saying that the idea that someone should be killed if they leave the Islamic religion is just a few bad apples?" "That's horrible," Affleck replied. "(But) the people who would actually believe in an act that you murder someone if you leave Islam is not the majority of Muslims at all." After some crosstalk, Harris chimed in with his view that "we're misled to think that the fundamentalists (in Islam) are the fringe," as Maher added that moderate Muslims are afraid to speak out. Affleck responded that a better idea would be to criticize the Muslims who hold such views, not the whole religion. "What is your solution? To condemn Islam?" Affleck asked. The actor, who also directed the Oscar-winning film "Argo," set in Iran and shot partially in Turkey, has received some positive response from viewers who appreciated his perspective. "Did anyone enjoy watching an impassioned @BenAffleck on Bill Maher as much as I did?" tweeted actress Jada Pinkett-Smith. "Real Time with Bill Maher" airs on HBO, which -- like CNN -- is a division of Time Warner. Kim Kardashian rocks North West on her fingers. Movies: The 'Equalizer' dominates box office!